Melbourne Victory and Central Coast Mariners drew two-all at Etihad Stadium on Saturday night after a first half of high quality football and second whose rhythm was disrupted by the sending off of Mariners’ Patrick Zwaanswijk. For Victory, Isaka Cernak started his first game for the season in place of Guil Finkler in an unaccustomed midfield role. Archie Thompson went down with a gastro attack after the team sheets had been distributed and his place was taken by Andrew Nabbout with Chris Christaldo coming on to the bench. 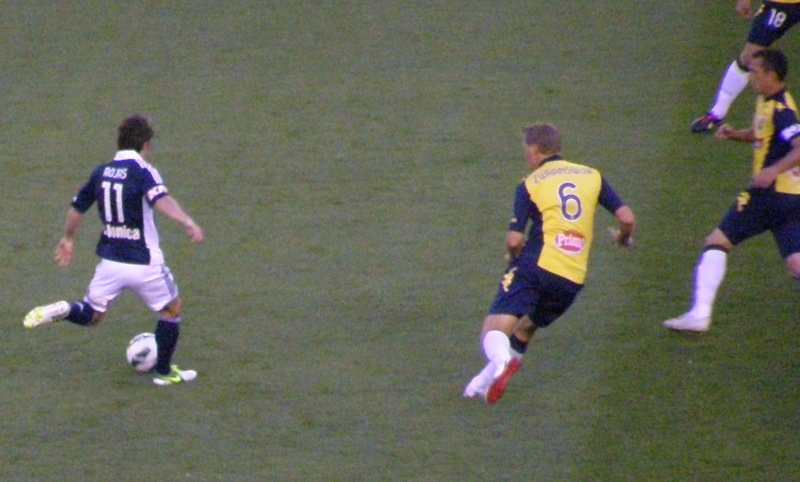 Mariners had their settled side which beat Melbourne Heart in its last visit to Victoria. Three Mariners had been overseas on international duty in midweek, as had Marco Rojas and Thompson of Victory. The 19,462 fans witnessed a first class first half—probably the best this season for these two teams. There was a huge contrast in styles with Mariners countering with long balls as Victory tried to pass their way through a tightly organised midfield and defence. 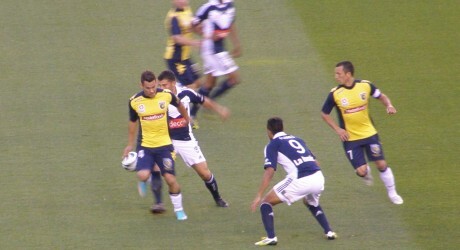 Mariners got a flying start when Mile Sterjovski was the recipient of one of the long passes out of defence. He sprinted down the left wing and crossed quickly to the onrushing Daniel McBreen who fired it past Nathan Coe in the 4th minute. 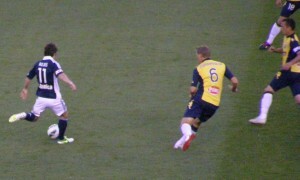 Victory’s reply was equally impressive as Marco Rojas beat his man on the right and hit a hard high ball across goal. Andrew Nabbout had to lean back but he got power on his header and it flew past Matthew Ryan. That came in the 10th minute. Marco Rojas and Patrick Zwaanswijk, two players who had a big influence on the outcome of the game. Eleven minutes later Trent Sainsbury sent another ball forward for McBreen who turned Petar Franjic inside out and finished with a shot that Coe could do nothing about. That lead lasted till the 40th minute when Victory got a free kick out on the right. Isaka Cernak sent it across and just behind the retreating defence, but it was Mark Milligan who judged the ball best and deflected it past Ryan with a neat header. That was almost the end of the best first half of football seen in Melbourne this season. Five minutes into the second half referee Strebre Delovski dismissed Zwaanswijk for a foul on Rojas. The bid Dutch defender had earlier been booked for delaying the game by kicking the ball away, so the decisions were harsh but certainly in line with the rules of the game. The Mariners were forced into defence, which coach Graham Arnold said afterwards was not what they had planned to do when they came to play Victory. Victory is not yet at the stage where it can break down defensive teams and by the end the fans were imploring the players to shoot on sight instead of trying to pass their way through or around the defence. To be fair however there were at least three cross-shots which went almost along the Mariners’ goal-line with no Victory player able to get the slight touch which would have taken the ball into the net. Ange Postecoglou had to withdraw Nabbout who had run himself to a standstill and another very young player, Christaldo, came on in the 70th minute. The youngster showed some nice touches and chased hard but it was difficult for him to have big impact in the closing stages of the game. Marcos Flores was another to receive a red card for a wild tackle in the 90th minute, having been warned shortly before and booked earlier in the second half. That meant that both teams had ten men for stoppage time which lasted four minutes, but there was no change to the score. Rojas had an outstanding game for Victory, while Tomas Rogic stood up for the Mariners until he was substituted for tactical reasons to shore up the visiting defence. 39. Nathan Coe, 3. Adama Traore, 4. Petar Franjic, 5. Mark Milligan, 9. Marcos Flores, 11. Marco Rojas, 13. Diogo Ferreira, 14. Billy Celeski, 19. Isaka Cernak (6. Leigh Broxham 78’), 23. Adrian Leijer, 26. Andrew Nabbout, (27 Christopher Christaldo 70’).